The daily grind has us sitting in cars, working at desks, and looking at screens all day. Sometimes we need to take a break from all that and stimulate our brains with something more fun. Remember when some of the best toys ran on your imagination, not on batteries? Toys like that are still around today and they are loads of fun to play with, even as an adult. Clear off a table or stretch out on the floor and check out these awesome marble run track sets. They combine brain-teasing construction skills with fast-paced racing. Planning and building a course is a great activity for kids and grownups of all ages. Building these tracks takes coordination and patience but comes with the payoff of seeing your marbles zip through the completed track. It also takes an appreciation for trial and error as you try out configurations that might not work. Race your friends, have family competitions, or test your skills against your own times. Marble run tracks are easier than dominoes, because one little jiggle doesn’t cause the whole structure to fall. Feel the satisfying snap as pieces fit together, like LEGO bricks, and be proud of a successful track coming together. And these sets are more advanced than Mouse Trap, because despite the fun of that game, the track can only be put together in one way. These marble run tracks are only limited by your imagination. These tracks are attractive works of sculpture, too. Dozens of sturdy plastic pieces in each set are made in rainbow-bright colors. The pieces come in a variety of sizes, obstacles, wheels, and tracks for your marbles to navigate. Each set comes with at least five marbles so there’s no chance you’ll lose them all on the first run. Put down your screen and pick up something fun for your brain and your hands. Let the good times roll — these marble run sets will satisfy all your cravings for fun. This Grand Prix Set starts the Marbleworks collection. Design your own super-sized marble raceway! With 8 different exciting marble actions, each new race is just as exciting! Split your track into 2 paths, experiment with the various marble action ramps, and then rejoin onto a single track to determine the winner at the finish line. "Built to Last" DT quality. Compatible with previous Marbleworks products. Additional MARBLEWORKS Brand Marbles, designed exclusively for Marbleworks Sets, are also sold on Amazon. For over 40 years, Discovery Toys has been wowing kids and grownups alike with products like its MarbleWorks sets. The Grand Prix set features a starting gate for six marbles and a splitter for creating two simultaneous tracks. Test different track setups to find the fastest configurations. Steep slides, sharp curves, and jumps combine to make challenging tracks for your marbles to navigate. Let’s hope they make it to the finish line! These translucent Marbulous track pieces add a new dimension to your racing, allowing you to see your marbles on every part of their journey. Create multiple starting chutes with separate tracks and watch your marbles race to the bottom. The Marble Genius Marble Run Super Set also features wheel pieces to create eye-catching movement marble race through. The Marble Genius app for iOS and Android includes several project instructions in four skill levels for inspiration. But don’t stop there. Push your creativity to the limit. 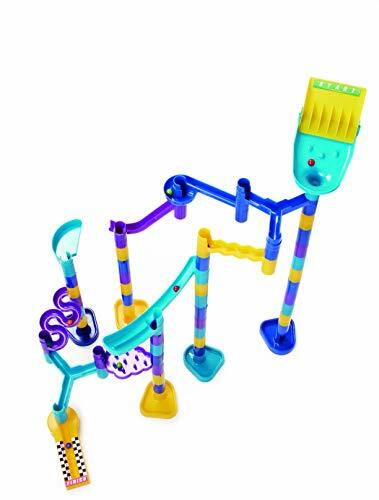 NO HASSLE CREATIONS: Marble Run is a MindWare favorite among youngsters and is the perfect introduction to marble runs with pieces that go together and pull apart with ease. TOYS THAT TEACH: Exercise your hand-eye coordination and spatial skills while putting your imagination to the test. This is a great way to introduce children to trial and error. CREATIVE PLAY: Build a Marble Run track that twists, turns, races and spins marbles at incredible speeds! ENDLESS POSSIBILITIES: These brightly colored chutes, tubes, drop-throughs, merry-go-rounds and spinners stack and click together to create hours of engineering fun. 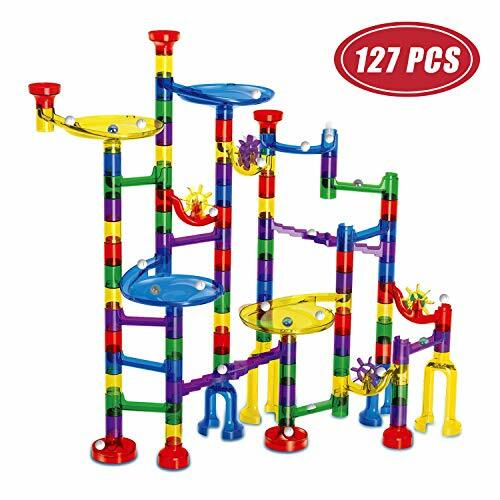 Build it tall with over 100 track pieces included in the MindWare marble run set. 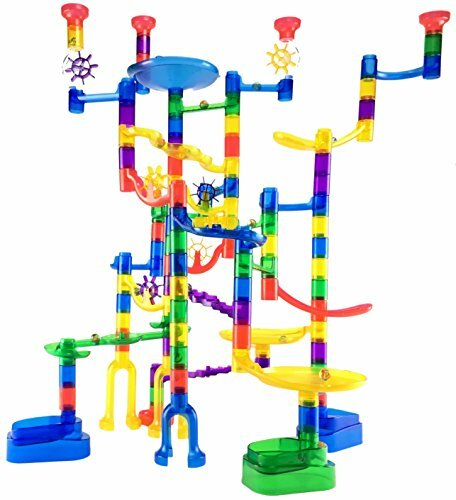 MindWare specializes in puzzles and engineering toys and their marble run track doesn’t disappoint. This set features a number of bridge pieces that connect marbles between towers and a mix of translucent and opaque pieces, so you never know where your marble may pop out. Hopefully you created a successful track so those marbles are popping out at the finish line, not rolling away on the floor. With 20 marbles, though, maybe you can afford to lose a couple. Ideal Marble Building Set Gift for Kids Age 4 + Year Old. Build various tracks and see marbles go up, down, all around, and fast! Tracks include centrifugal funnels, U-turn slides, windmills, straight slides and gradient slides, height 70cm or so for much more fun! Safe Marble Set for Kids. This building toy is made of solid transparent ABS, absolutely non toxic, not easy to break or snapped. Smooth edges avoid scratching hands. Pieces stay tight, not easy to get loose when play with it! Develop Patient and Problem-solving Skills. All parts must be connected correctly to make sure marbles pass through and arrive at the bottom. In the repeated assembly process, a child can gain basic knowledge and develop patient, problem-solving skill. Kids Toy for Both Boys and Girls. Package includes 90 action pieces and 32 marble pieces(16 marbles) and 5 glass marbles. Ideal marble game toy choice for birthday gift, children party favor, after-school fun, Christmas presents and all other holidays. Feel like a kid again with these brightly colored track pieces and keep the fun going through all the marble racing. The translucent pieces in the Meland marble run set are larger and sturdier than the connector pieces in other sets, allowing you to build a track that’s nearly two feet tall. The last thing you want is your tall towers to collapse before your marbles get a chance to race through, although half the fun may be building a new track. Anyone who loves construction sets will love building with these pieces. 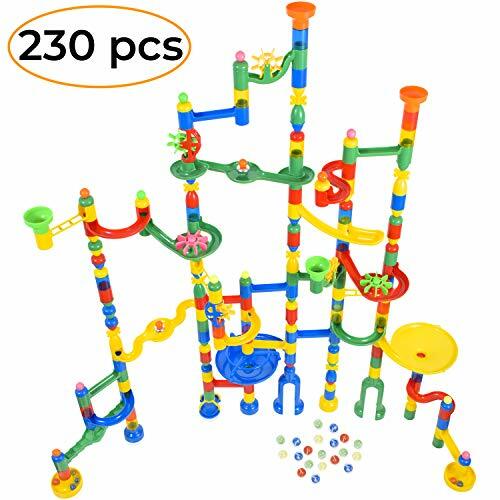 BUILD LIFE LONG SUCCESS - CONSTRUCTION TOYS TEACHES SCIENCE & ENGINEERING: Marble track building toys sparks CREATIVITY, promotes PATIENCE, and develops PROBLEM SOLVING, REASONING, fine MOTOR SKILLS, HAND EYE COORDINATION and LOGICAL THINKING - all by PLAYING with the best STEM toy building set on the market. AMAZING VARIETY - STIMULATE THE MIND: THE ONLY marble tower set that includes ALL THE BELLS & WHISTLES - Colorful Funnel & Ladder Glides, Wheels & Windmills, Straight Slides, S Shaped Slides & U-Turns, 24 Translucent Tubes & even 2 marble works pieces create a satisfying "Clink" upon contact with EXTRA LARGE Marbles for Kids. MONEY BACK GUARANTEE - SHOW YOUR SUPPORTS for STEM Learning or AUTISM with your purchase of our marble set. Simply follow the instructions on the included card to support a charity and advance the lives of children with Autism www.autism-society.org, or advocate STEM Careers in underserved communities www.greatmindstem.org. So go ahead, click add to cart now, try it risk free for 30 days and love it or your money back! Don’t just build a marble run track, create a work of art from these bold pieces. 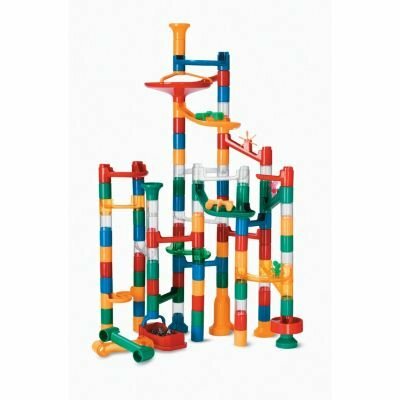 The MagicJourney Giant Marble Run set truly is one of the giants of its kind, featuring just about all the different track pieces from the other sets in one huge collection. With 200 assorted track pieces and 30 marbles the building and racing fun can last for as long as you can. It comes with a building guide that has instructions for several mazes of different skill levels for hours of fun, plus hundreds of combinations from your own imagination. The colors are as bright as a box of crayons, so think of your play space as a blank canvas.